Today, I received an email from the developer asking if there is a better way instead of the COUNT (*) Transact-SQL statement, to count the number of records in a table. My reply to his question is yes, there are several methods to get this information from SQL Server. However, none of these approaches are perfect, and has its own disadvantages. In this blog post, I will show different methods of count number of rows in a table. Before discussing the different approaches, I must emphasize that the COUNT (*) statement gives you the true count of the total number of rows in a table. The COUNT (*) statement performs the full table scan on heap table and cluster index scan on tables with clustered index, to get the exact count of the records in a table. Because of this, it can get slower as the table gets bigger, as effectively it is counting each row separately, which includes the rows that contains null values. For more information about COUNT (*), see MSDN resource here. -- Ensure a USE [databasename] statement has been executed first. Although it is one of the fastest ways to count the number of rows in a table, however, according to sys.partitions documentation, the count is not always accurate. I personally could not find anything on the MSDN that tells me the cases where the count will not be accurate. The only situation in which I found count is not accurate is when I run this query while DML operations are in progress against the table for which I am counting. When I compared STATISTICS IO output of both queries, I noticed that the sys.dm_db_partition_stats dynamic management view query version is slightly faster than sys.partitions catalog view query version. 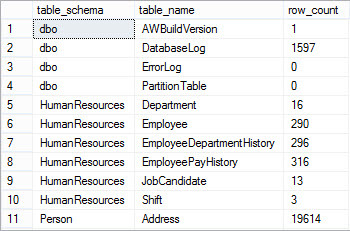 Examine the STATISTICS IO output of both queries that shows that SQL Server is doing a less work to retrieve the row count information using sys.dm_db_partition_stats dynamic management view query version. Table 'syssingleobjrefs'. Scan count 75, logical reads 151, physical reads 0, read-ahead reads 0, lob logical reads 0, lob physical reads 0, lob read-ahead reads 0. Table 'sysidxstats'. Scan count 77, logical reads 175, physical reads 0, read-ahead reads 0, lob logical reads 0, lob physical reads 0, lob read-ahead reads 0. Table 'sysschobjs'. Scan count 0, logical reads 768, physical reads 0, read-ahead reads 0, lob logical reads 0, lob physical reads 0, lob read-ahead reads 0. Table 'sysrowsets'. Scan count 1, logical reads 8, physical reads 0, read-ahead reads 0, lob logical reads 0, lob physical reads 0, lob read-ahead reads 0. Table 'sysidxstats'. Scan count 76, logical reads 164, physical reads 0, read-ahead reads 0, lob logical reads 0, lob physical reads 0, lob read-ahead reads 0. Table 'sysschobjs'. Scan count 0, logical reads 384, physical reads 0, read-ahead reads 0, lob logical reads 0, lob physical reads 0, lob read-ahead reads 0. It is not necessary to include the parameter names (@parametername =) when running this command. I have also compared STATISTICS IO output of this query with above two queries and noticed that it is much slower than other two queries that I shared in this blog post, but still much faster than equivalent SELECT COUNT(*) version. I hope you liked this post 🙂 . Please feel free to use comment section, If you have any question regarding this post. You can also drop me question via twitter (@BasitAali). These methods are all very fast, but also all flawed. All of them take their information from system objects that are used to track at a physical level, not at a logical level. In other words, they don’t care at all about transactions and consistency. Select and execute the first part (up to the first go), but do not execute the rollback yet. Now switch to another window in SSMS and try counting rows using any of the methods outlined in this post. All of them will report zero rows. Now switch to the first window and execute the ROLLBACK. Logically, the delete has never been executed and the table has never been empty. The same can happen with a data modification that rolls back immediately due to a constraint violation. The time slot of the incorrect results is much smaller of course. But to simulate high concurrency, you can have one window with a loop that continuously tries to delete from a table that is referenced by a foregin key constraint, then have another window with a loop that continuously checks the row count in both tables and outputs a message to the console when it sees an impossible number (non-zereo rows in the child table, but an empty parent table). Leave it running for a few minutes, then check the results. That’s a very inspiring post… Congrats! I have used almost all of the above techniques to count the rows in a table but unfortunately they don’t always give you accurate result. It relies on the statistics of the table. So if the statistics of the table is not accurate then it will give you false result. So I don’t trust these techniques. What happens if we use COUNT(1) instead of COUNT(*)? Any chance to explore on that?